Bharti Airtel has come up with yet another offer this festive season. After providing free Rs 51 Amazon Gift Card to its subscribers, Airtel is now offering Rs 2,000 cashback for literally doing nothing. Yes, you heard it right. This festive season, if you purchase a new 4G smartphone from anywhere and insert your Airtel 4G SIM card on the new smartphone, then you’ll get Rs 2,000 cashback from Airtel. That’s it, you don’t have to perform a recharge or upgrade any postpaid plan to get the cashback. Airtel will auto-credit the cashback to your account, which you can use for the recharges or postpaid bill payments in the future. Of course, Airtel has launched this new scheme under its biggest digital programme- Airtel Thanks. Bharti Airtel has introduced this offer on the occasion of this festive season. Under this Festive offer from Airtel, existing Airtel customers who upgrade to a new 4G handset will get coupons worth Rs 2,000. Do make a note that existing users should be on the network for more than 90 days. The Rs 2,000 cashback will be auto-credited to your account in the form of 40 vouchers of Rs 50 each. This Festive offer is available for both Airtel prepaid and postpaid customers, provided the number is 90 days old on the network. Moving onto the most important part: How can you make use of the coupons, prepaid coupons can only be redeemed against prepaid recharges of Rs 199, Rs 249 and Rs 448 done through My Airtel app. Whenever the customer chooses the eligible recharge, the discount will be automatically applied. Postpaid users on myPlan Infinity plan priced above Rs 399 will be able to redeem the coupon. Only one coupon can be used per transaction, and they’ll be valid for 40 months from the date of credit. Bharti Airtel is betting big on its digital programme, Airtel Thanks. Under the programme, all Airtel customers who commit a monthly ARPU of Rs 100 and above will receive additional benefits at no extra cost. These benefits will include access to premium digital content, great offers on smartphones and online shopping vouchers. The higher the monthly ARPU commitment, the more benefits a customer gets. Furthermore, Airtel also stated that Airtel Thanks customers would also get red carpet customer care for service and network related issues to add to the experience. As you might be aware of, all these benefits will be digitally delivered through My Airtel App, Airtel TV, and Wynk Music, which makes the experience completely seamless. Customers will receive regular offer updates round the year under the newly created Airtel Thanks section on My Airtel App and Airtel TV. Additionally, Airtel stated that it’s partnering with the best of brands across product categories to enable Airtel Thanks. Airtel Thanks programme was introduced a while back and the company’s prepaid, postpaid users are already enjoying some benefits. 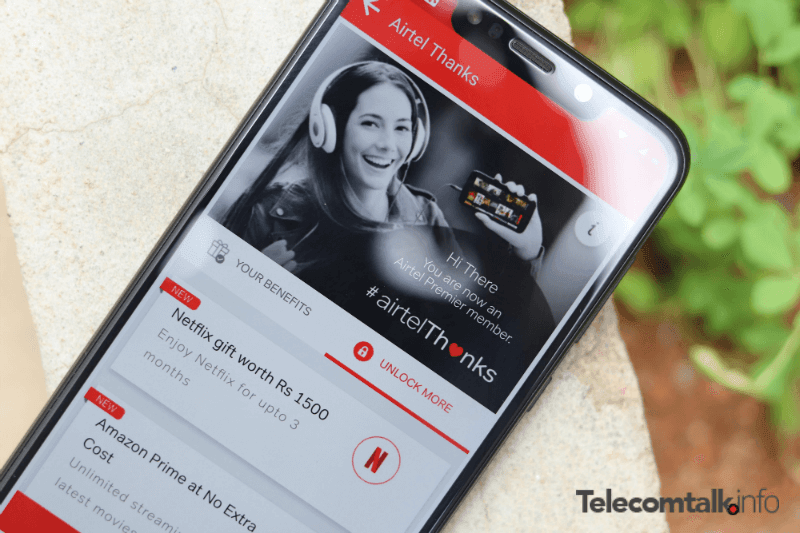 Right now, Airtel postpaid customers on plans priced above Rs 499 are eligible for Netflix subscription worth Rs 1,500 for three months and one year of Amazon Prime membership. Furthermore, all the Airtel prepaid and postpaid customers with monthly ARPU commitment of Rs 199 and above will get complimentary access to premium ZEE5 content including original series and movies. This benefit can be accessed by eligible Airtel Thanks customers via Airtel TV app. Airtel also teamed up with Flipkart for the Big Billion Days sale. Airtel prepaid customers can get special benefits of up to Rs 4,500 along with 100GB of bonus data on all Flipkart exclusive smartphones as part of the Airtel Thanks programme. The offer will be available to customers who have or will recharge with an unlimited bundled pack of Rs 199, Rs 249 or Rs 448. In a press release sent out by Airtel, the company confirmed that it would soon announce Airtel Thanks benefits for its ‘V-Fiber‘ home broadband customers. That being said, Airtel is already offering a free subscription of Amazon Prime for one year with some of its broadband plans and already announced it would provide free Netflix subscription worth Rs 1,500 for three months. Dear Airtel Retailer, following RC will be closed soon (TT 20,30,39,50,69,80,100,110,120,150,200,300,600) & SVV( 17,18,16,28,43,46). Recharge with any Bundle RC or Smart pack RC 35,65,95,145,245,494. Contact your TSM for details. Are they gonna do it in Kolkata as well? I mean, even here their 3G runs on 900Mhz. For whatever unknown reason I am seeing Idea without CA give similar speeds as Airtel with CA. Dunno what’s going on? @CM Ji, just wondering whether you answered his query or just exploited an opportunity to reply? Also, may be MCN is also a reason but it cannot be considered as the same case with every BTS that faces congestion. Isn’t it?